> This is a retrospective story about the narrator’s family in the fifties. It’s a family that will look familiar to a lot of people, in most respects, but there’s something odd about the father. He’s too cheerful. He takes care of whatever problems there are around the house, and there are a lot of problems in the new house he’s purchased for the family against his wife’s wishes. There’s a good deal of tension in the house thanks to the nagging, and yet the father keeps going. Until, that is, he become involved in a minstrel show, and suddenly he’s singing odd songs and telling bad jokes at home, and acting differently at work. The father has become “Mr. 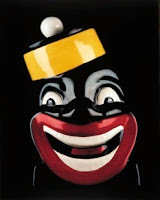 Bones,” the black-face minstrel and the whole family is embarrassed at the prospect of attending the public humiliation that will be the performance. And then the show is over and things go back to the way they were. Except not quite . . . It isn’t clear what Theroux’s point is here. At the end, there’s the mention of school integration, and that suggests that the black-face has a political point in the story, which is possibly that change isn’t what we anticipate, but it does open the door. I don’t think the story quite gets where it needs to go to be successful, but until its somewhat flat ending at least it is an engaging read. >interestingly, that minstrel face looks a lot like the controversial painting in “Ghost World.” Have you seen it?